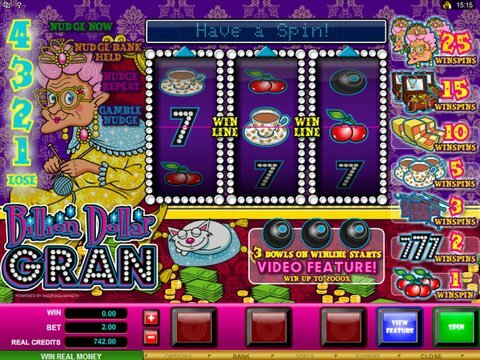 Follow an old and ultra-rich grandmother playing the colorful Billion Dollar Gran online slots game, which has 3 reels and 1 payline. The game is simple to play not only because of the 3 reels and 1 payline, but there are not many features. There is a bonus game, but there is not a wild or scatter symbol, a multiplier, or free spins to be won. While the grandma is loaded you do not have to be to play, as the betting range is from just 1 cent all the way up to $10. Enjoy it here with no download required. Some of the symbols you will see in this slots game include teacups, batten berg cake, jewelry boxes, 7's, cherries and the Billion Dollar Gran herself. There are unique nudges in the game, which allows you to nudge the reels a tad to give you a win. There are 2 features that you will get by spinning on 3 of the Billion Dollar Gran symbols where you can win 25 win spins and when making win spins you have the chance to multiply your wager up to 1000x. Yeah, not bad for an easy game to play where you can win as much as a cool $20,000 on a single spin. The paytable is right on the main page, so you know what all the winning combinations are and exactly how much you pay out. Microgaming is a popular software company that is always releasing new and fresh games. They have done a great job with this free online slot, which can be played with real credits or in a demo mode. If you want to try your luck and try to pry some money out of grandma then head to Spin Palace Casino. Canadian players who are new to site and newly registered can enjoy the casinos free no deposit bonus available as well.